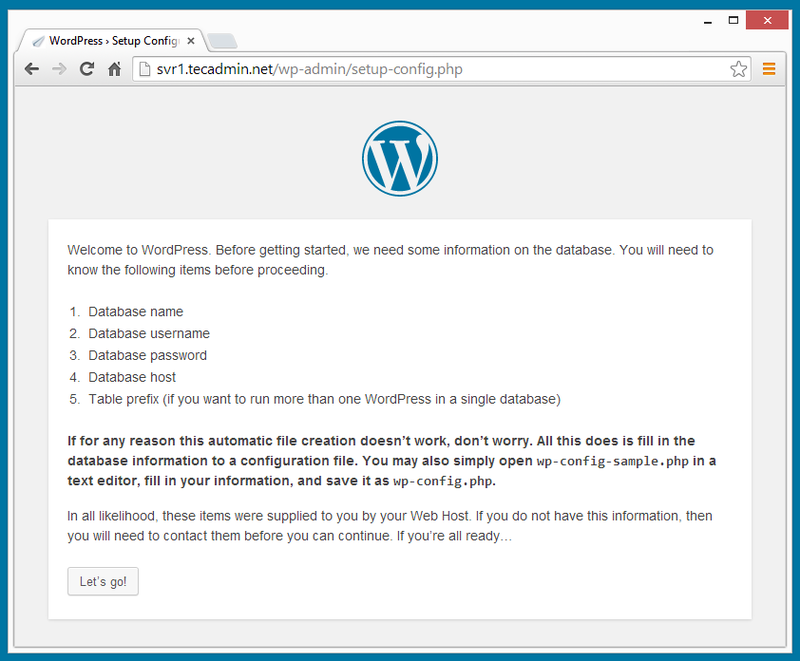 These latest version of WordPress are always available here (.tar.gz) and here (.zip). You can download any files to your system. Use belwo command to download gzip file of latest WordPress to your system using the following command. Extract the downloaded archive to the document root of your domain and update permissions on files. 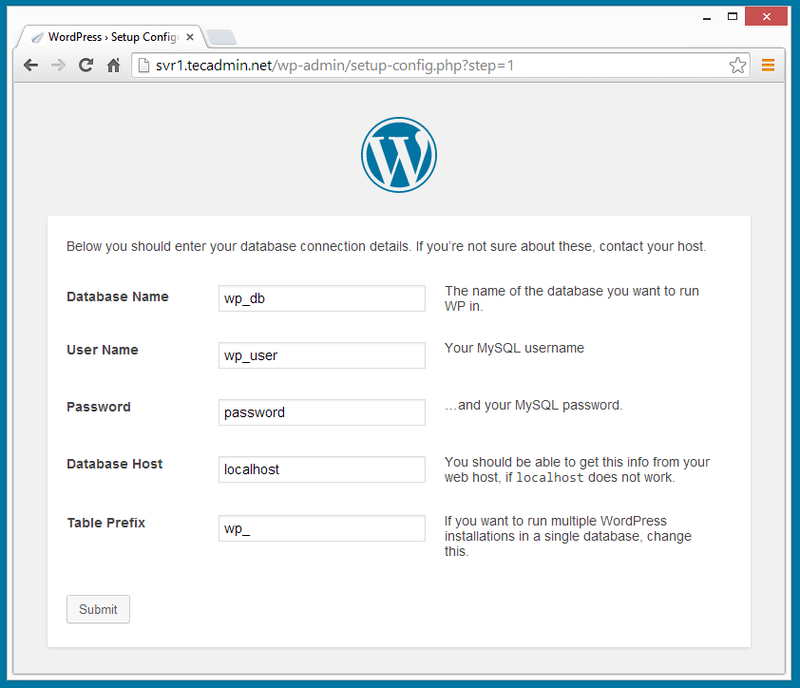 After extracting code we need to create a MySQL database and user account for configuring WordPress. Use following set of commands to create database and user after login with the privileged user. 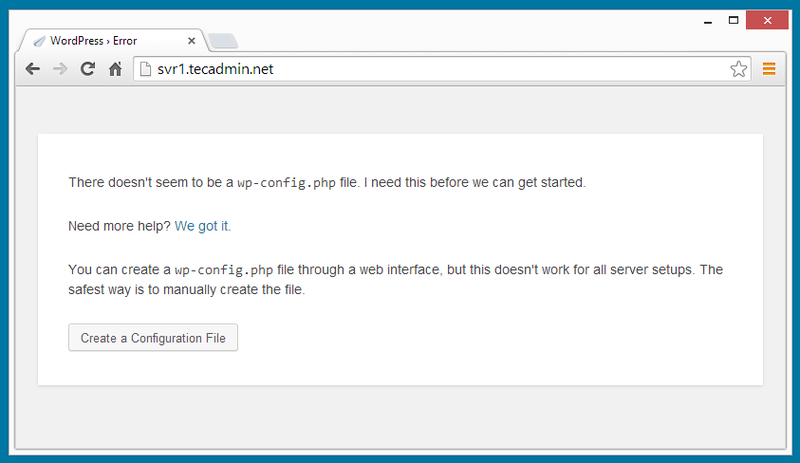 Now the time is to create and configure apache configuration file and add a new virtual host for WordPress setup like below. If you already have another virtual host created in the config file, make sure to enable NameVirtulHost for using multiple VirtualHosts. Reload Apache service to read configuration file again. 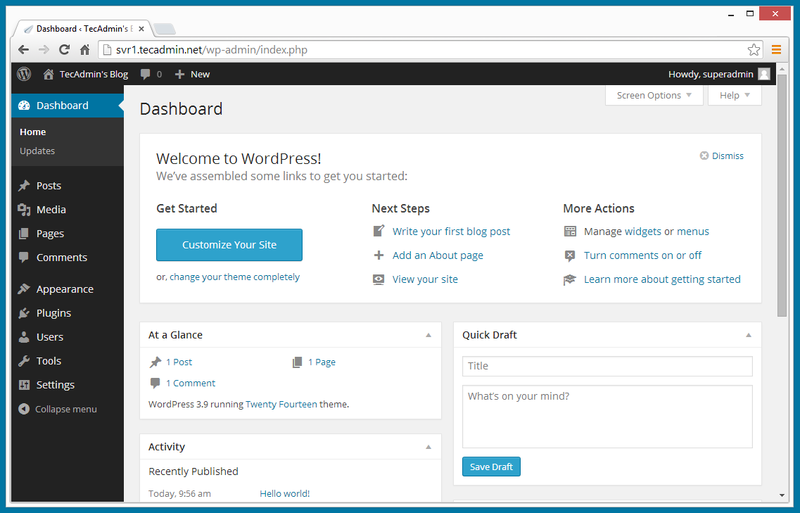 WordPress provides a web installer for easy to setup WordPress without editing files manually. After completing above steps just point your browser to your domain. 4.1. 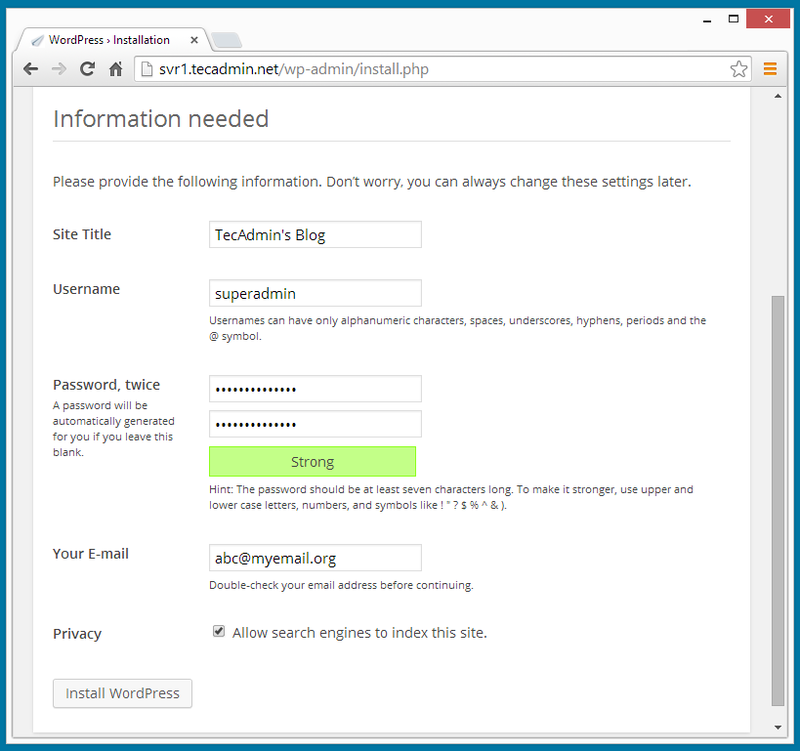 Open URL in Browser and Click on Create a configuration file. 4.2 In this step just click on Let’s Go button. 4.3. Fill the database details and click “Submit“. 4.4 After submitting database details, click on “Run the Install“. 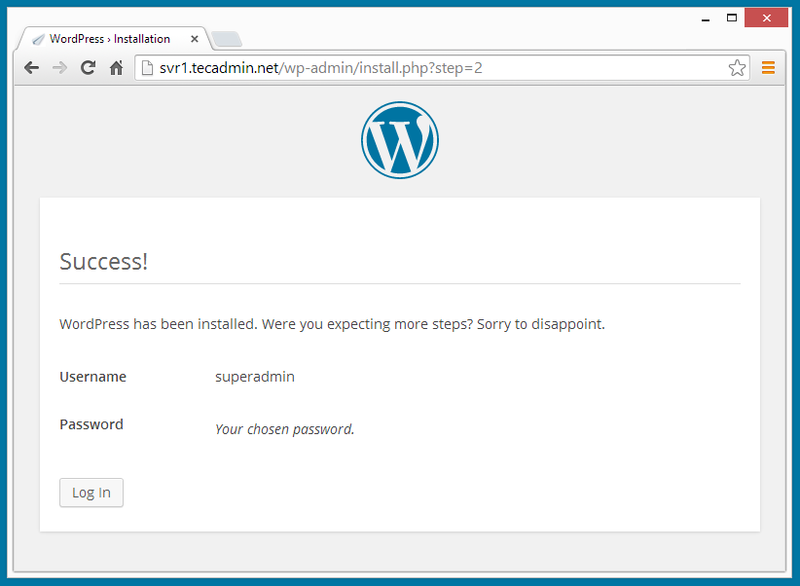 4.6 After completing above step, You have installed WordPress successfully, Now you will get WordPress success installation message. 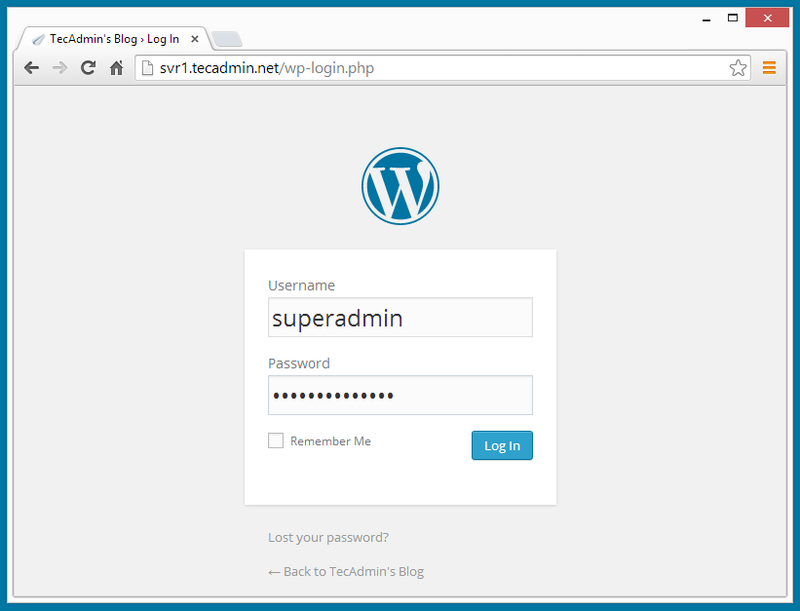 After entering correct login details, you will be redirected to WordPress admin dashboard. where you can create a beautiful blog and connect with the world. Congratulation! 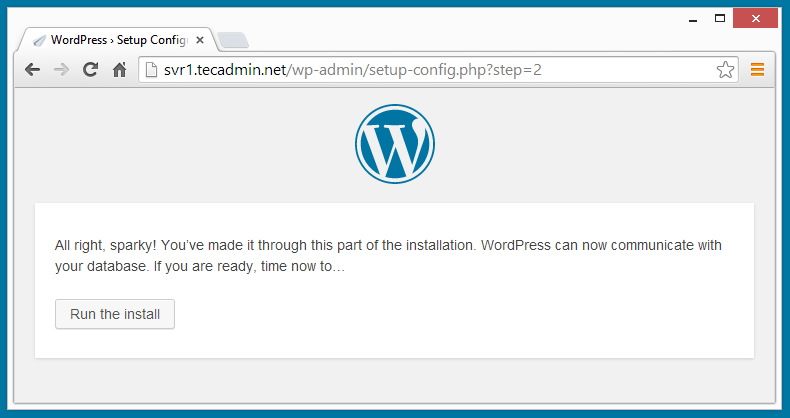 You have successfully installed WordPress. I’ve followed your steps and confirmed that the FastCGI module is enabled using the php_info file but I still can’t upload anything to WordPress… I’m getting the same error Evon was getting. Isn’t this suppose to make 755 work so that I don’t have to use an insecure 777??? Unable to create directory wp-content/uploads/2014/10. Is its parent directory writable by the server? Have you setup proper permissions on parent directories also like uploads, 2014 etc. Awesome post. Please note that “” in the virtual host section should be “”. Thanks to inform.. I have make necessary changes in VirtualHost section..